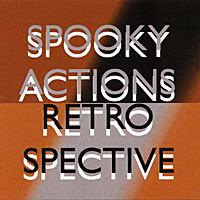 Spooky Actions is, ironically, a very non-spooky-sounding ensemble that employs guitar, bass, drums, woodwinds and cello to reinterpret Early, Western classical and Native American music in a light jazz setting. Retrospective gathers together truncated versions of lenghty recordings from the band’s voluminous vaults. (Most of these tracks include both straight and improvised versions.) Hailing from 200 BC and the 11th century, “Early Music” starts it off with two super-mellow flute-led excursions–one peppy and propulsive, and another that could lull you to sleep on a Sunday afternoon, no problem. You are currently browsing the archives for the Spooky Actions category.